Ever so often there is a surprise piece on the scene that everyone I love gives a go. A couple of months ago I posted about my new found love for my Paige Sierra dungarees, and as if I needed any more encouragement to wear them I've spotted so many of my favourite style icons (I hate that term, but can't think of a better one) wearing them including Ms Palermo last week out and about in New York and Courtney from Always Judging. 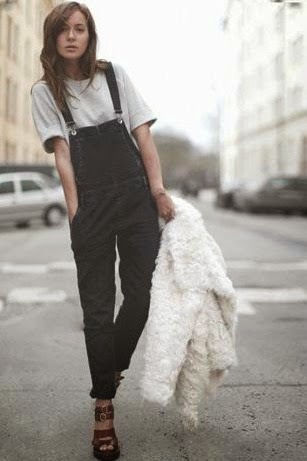 If you're nervous about trying dungarees (or overalls, if you are an American) then these Paiges ones are a fab place to start. They're essentially fitted jeans with a bib so you don't feel like your drowning yourself in denim, and they actually fit. Arguably pricey, but to be honest quality denim should be otherwise it will be around your ankles by lunchtime and never fit again (saying that, if you're really looking to test the look on the cheap then I spied this pair by Glamorous for £14). Below is a little "market edit" should you need it - though totally vouch for the Paiges... I'm obsessed. How do these fit? Are they true to size?